For the past fifteen years, we have been reminded that our Malki's yahrzeit (the Yiddish word for the anniversary of the day she was killed) is near when we see the sign announcing the Ezra charity bazaar in her and Michal's memory. It is strung over the street where the annual event is held several days prior to it. But this year, the Ezra kids organizing the event notified us that the sign would not appear. Shortly after hanging it up, they were given word that a municipal inspector had ordered it removed, failing which they would have to pay a fine. 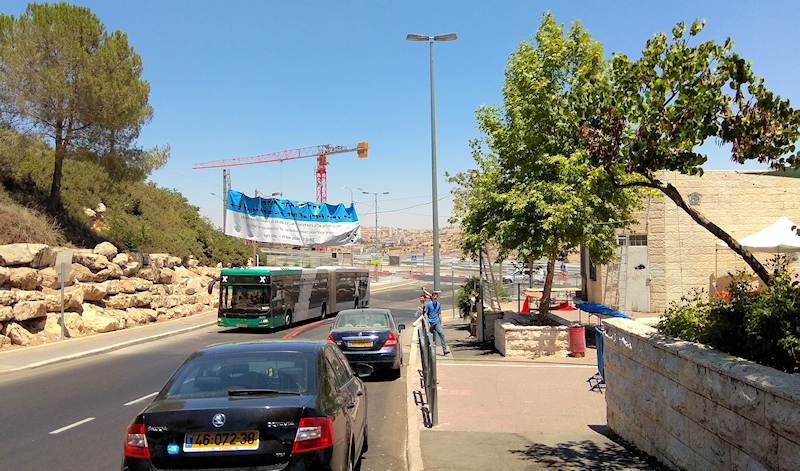 Apparently some resident of Jerusalem’s Ramot neighborhood had complained. Technically, signs hung above roads are forbidden without prior authorization. I was shaken up by that news. The knowledge that somebody in the neighborhood could be so grossly callous was incomprehensible. After all, we're talking about an innocuous cloth sign neither interfering with nor harming anybody. Fortunately, the person who had printed the sign for Ezra is a neighbor and offered to solve the problem by contacting the local municipal representative who is a friend of hers. He granted official permission for the sign and it has been hanging lawfully for the last three days. 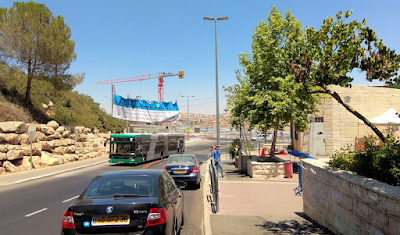 Prior to the permission being obtained, the Ezra kids had moved the sign to an alternative site in the neighborhood - not hung over a road but tied to a wall of stones. Shortly after placing it there, they found that the sign had been flipped over so it couldn't be read. At the same time, we have been grappling with similar callousness towards victims of terror from American officials. The gloating monster who murdered sixteen men, women and children at the Sbarro pizzeria, a woman called AhlamTamimi, is still free and safe in Amman, Jordan thanks to prime minister Netanyahu's 2011 Shalit Deal. King Abdullah II of Jordan, brazenly pretending for the world that he is a determined enemy of terrorism and defender of justice, refuses to extradite her despite the existence since 1995 of a signed extradition treaty between his country and the US. Plainly, that treaty is not worth the paper it’s written on. The king knows how his Palestinian Arab constituency would react to Tamimi's extradition to face justice in a US court. Nothing else matters to him - as long as the United States panders to him. The ball is now in the court of the US State Department which has been egregiously unhelpful in the matter. While we await their response regarding steps State could but isn't taking, more details can't be divulged. But stay tuned for them in coming days. Meanwhile, our prime minister – who is the prime reason our child's murderer is enjoying her life - is busy appeasing the king. The two recent conflagrations - security measures at the Temple Mount and the incident at the Israeli consulate in Amman - dominate his interactions with Jordan. Certainly no pressure on the Tamimi front has featured in Netanyahu's relations with that neighbor. Nor is it likely to ever do so. After all, the Shalit Deal [“19-Oct-11: Haaretz: Shalit prisoner swap marks 'colossal failure' for mother of Israeli bombing victim”] was Netanyahu's "baby", one that he proudly brandishes regardless of the grief it has spawned. The Good is outnumbered two-to-one in the title of my blog. So too it is outweighed on this planet by The Evil, The Corrupt and The Seamy. For the most part, I focus here on those negatives - along with a light sprinkling of The Good. When I address The Bad and The Ugly here, it’s mainly in relation to two topics: (a) Terrorism and the current Israeli government’s pathetic handling of it; and (b) Children with disabilities and Israel's pathetic handling of them. (I have blogged about this for some years, but under an assumed name.) Also expect occasional digressions to other Bad and Ugly topics that plague Israel. I hope readers will share their thoughts here too. 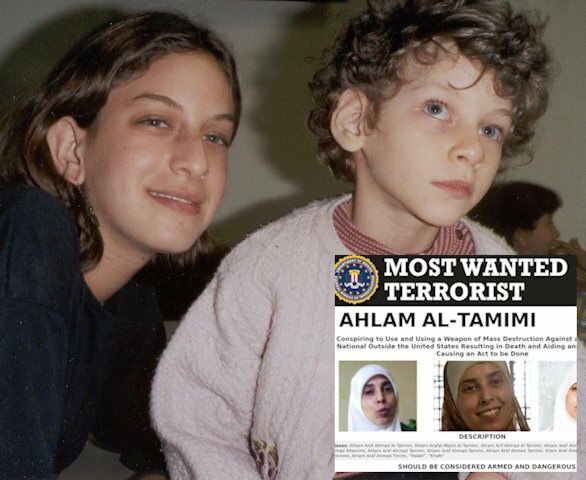 The murder of my precious daughter Malki, aged fifteen and a half, in the massacre at the Sbarro pizzeria in Jerusalem on August 9, 2001, colors this blog intensely. 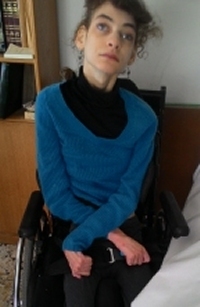 The life and challenges of my youngest daughter Chaya, profoundly disabled physically and cognitively, colors my discussion of disabilities. In 1988, I moved to Jerusalem from Queens, NY, following a 12-year-stopover in my husband's hometown, Melbourne, Australia. The law degree I earned decades ago has lain mostly unused ever since and portrait sketching is one of my passions, so those sketches are likely to appear in my posts now and then.